I love reading books of every kind but I am a fool for a great romance novel with some suspense. One that will leave you hungry for more each and every time. It is my escape form a stressed out job and four beautiful kids. I love my husband as well but I still need a break from time to time. It gets me out of my head and into another world. "Though my mind questioned my ability to find the high he'd already provided, my body knew better. The more he fanned the flames of my desire, the more my muscles tightened and toes curled. Higher and higher we flew until our blaze of passion exploded, leaving us both victim to the spectacular detonation. With a guttural growl, he collapsed against the wall, pinning me in place. With the water still falling, waves of pleasure washed through me." 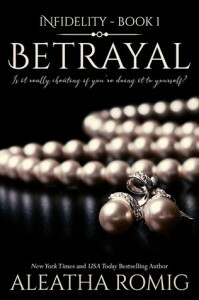 Betrayal by Aleatha Romig is a MUST READ. Full of passion and tears and laughter.